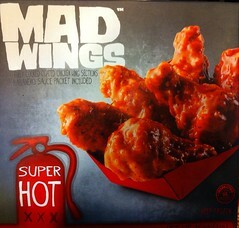 MAD WINGS is exactly the type of frozen food I like. It’s your basic “hot wing kit” that contains chicken and a separate bag of sauce to toss the wings in after cooking. Found these at Walmart and haven’t seen them anywhere else since. They appear to be made by a company called Simmons, located in Oklahoma, so these might only be exclusive to Walmart. On the back of the box there is close to a dozen different flavors listed. In the freezer section of this store, there are only a couple. Honey BBQ, SUPER HOT, and ASIAN. If you have read this blog at all, you know where I am headed here. Oh yeah…the photo gives it away…duh… I got the SUPER HOT. I love hot, and more often than not…. a company comes out with something they call “SUPER HOT” which ends up being….to me…. “meh…kinda spicy.” So I am really gonna be hard on these kids. Pouring them out onto I notice the color of them. They are already brown. They actually look cooked already (see right) but they are indeed frozen. Turns out my suspicions are correct – the box tells me– that these chickie-babies are “fully cooked” which means I just have to warm them up, not actually cook them from a raw state. I actually dig this because in my oven it takes almost an hour to bake chicken wings I get raw from the store. While these are cooking, I dig out the sauce packet. I tossed it into a bowl and microwave it for a few minutes. I tear it open and it’s a nice sauce. Thick and spicy. These might actually be SUPER HOT before I am done! One thing every house needs is a stainless-big-ol-wing-tossing-mixing-bowl. There is no way to get the sauce all on them babes unless you just literally toss them in the sauce. 20 minutes later and the wings are done. Immediately they are thrown into that bowl and showered with sauce. Toss like a boss and onto the plate. For five bucks and some change you get thirteen wings or about a pound. They are on the smaller side as you can see in the picture. I tried to find some info on them online – thinking that they might be natural or organic- hence the smaller size due to no growth hormones given to the chicken. But I didn’t find much info. So just know they are small pieces. But with 13 in the box I had no trouble getting full. Either way, These are pre-cooked, so after 20 in my oven they came out slightly crispy at the ends and SUPER tender. The meat was literally falling off the bone with the slightest pressure. That SUPER HOT packet started off hot and skipped all over my taste buds. This was pretty hot for a “wing-kit” so I will give them some props. So six bucks and twenty minutes and I can have these on hand in my freezer for those late night snack cravings? Dozens of flavors, tender chicken (albeit smaller pieces) and easy to make? Sold! 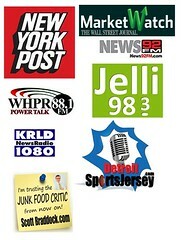 Categories Addictive, Frozen Foods, Taste Test, WINGS! I TOTALLY agree! I have also had these wings and love them but I haven’t been able to find them at Walmart lately. I found this brand at Sam’s Club. A 4lb bag was $14 I believe. The only flavor they had was Sweet Honey Mustard dry rub. Large wings and I do believe they are about the best overall wing I have ever had. I too have searched where to get the various flavor from and have been unsuccessful. Seems like with a good product you could find some information huh? The only place I have been able to find them is at Sam’s Club. I have had 2 different flavors a New Orleans and the Honey Mustard. We prefer them without the extra seasoning in the pouch. Wish they would carry them at Wal-Mart .. they would make a killing off of them! !